Barry W. Fitzgerald – AiPT! Barry W. Fitzgerald is a physicist and superhero enthusiast. He works as a research associate at Technical University of Delft (TU Delft) in the Netherlands on topics such as biofuels, polymers, granular materials, science education, and responsible innovation. 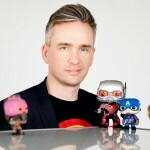 He is also the author of two popular science books - Secrets of Superhero Science and Secret Science of Santa Claus – and is the editor-in-chief of the open access journal Superhero Science and Technology. Whether Hawkeye or Ronin — does the Avengers’ Clint Barton have a literal eagle eye? Who says he doesn't have superpowers?